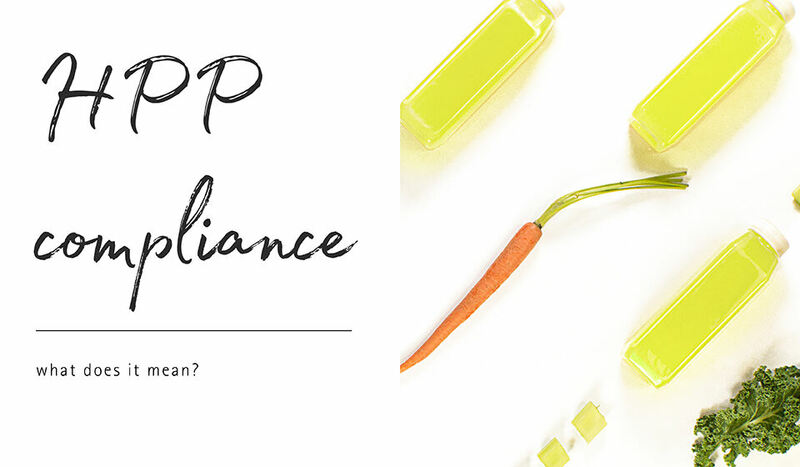 HPP Compliance – What Does HPP Stand For? High pressure processing, or HPP, is used in cold pressed juice manufacturing as an alternative to hot fill processing. HPP methods keep the fruit and vegetables used in juice bottles as fresh as possible. This processing method also helps maintain the natural color of the juice, retains the good taste, and extends juice shelf life. When using high pressure processing, fruits and vegetables are packed fresh in plastic bottles or other flexible containers. The juice containers are then placed into a sealed high pressure chamber, which is filled with water. The containers are then subjected to a high level of hydrostatic pressure. Pressure is applied to every area at the same rate so the juice bottles and the product inside remain unchanged. HPP is typically used in the manufacturing of juices, smoothies, purees, and sauces. Extended shelf life – the shelf life of bottled juice can be extended up to 10 times longer with HPP. Safety – HPP processing allows for microbial safety, protecting juice quality and reducing the amount of bacteria in the juice. Quality – juice ingredients will retain their vitamin and mineral content, which would otherwise be reduced by heat processing. Sustainability – high pressure processing only requires the use of water and electricity to keep production costs low. Product integrity – since no heat is used in the process, juice color, texture, and taste are preserved. Food or beverage businesses that utilize high pressure processing methods during production must implement and document all procedures according to Food Safety Management System’s HACCP principles. Specific HPP parameters such as holding time and pressure levels must be documented to ensure food safety and shelf life sustainability. Juice producers should work with accredited labs which have experience in determining shelf life and other microbiological parameters. The use of HPP in food and beverage processing is recognized and regulated by the USDA, FDA, and international food safety agencies. No specific label requirements concerning the use of HPP are required by these agencies, although many juice bottlers add HPP usage information due to consumer interest. BottleStore.com offers durable plastic juice bottles capable of withstanding high pressure processing methods. Discuss your bottling needs with our knowledgeable staff to learn about the large variety of juice bottles we have in stock. Jonathan is the Online Marketing Manger of BottleStore and it's parent - The O.Berk Company. In addition to making BottleStore work and run smoothly, Jonathan also enjoys passing on packaging knowledge to help solve customer pain points. He is the chief architect of Packaging Crash Course - a packaging resource hub for rigid glass and plastic packaging site.